1) The YOLLOY Shelter portable workstations fulfills the mission critical need to do your work in any weather, on site, on location at your customer or away from your home base. 2) The designers have put a lot of thought into how one person can erect this by remote inflation & then easily pack it away! 3) The outside air get inside the spray workshop chamber, when the chamber is fully filled with air, the air will get outside from another end where there is with active carbon filter, in this way, the polluted air will be cleared before getting outside of the enviroment. 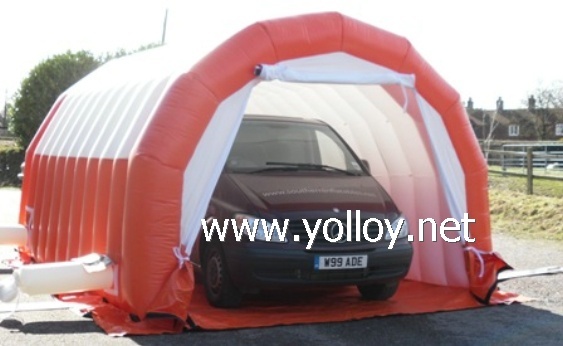 The portable inflatable spray booth is very easy to set up, inflatable for use and deflatable for transport to any sites where need it. it can be used as a portable garage for paiting, and car repair or temporay car shelter or temporary workshop and so on. Or used as car repair workstation. Light weight material, easy to handle it.